Halldór wearing an old fisherman’s costume. It is made from sheep-skin exactly the same as the Icelandic fishermen used, in the days when the French fishermen came to Iceland. María wears an old Icelandic costume, the same as Icelandic ladies have used through the years. María Óskarsdóttir, who lives in Patreksfjordur, has been collecting stories about the communication between the French fishermen and Icelanders, in the old days. She and her husband Halldór Árnason, are very interested to share the knowledge they have about the French fishermen because there also was such a great number of schooners from northern part of France that came to Iceland. Icelanders only talked about « The French Fishermen » i.e. 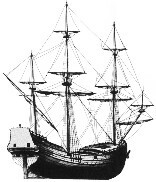 they didn’t say this one came from Brittany or that one from another place (schooners from Dunkirk and Gravelin were more at the east coast). Halldór is born at Patreksfjordur and heard the old stories about the fishermen, from the time he was a little boy. Patreksfjordur was an important place for the schooners because the cargo ships came here in May every year, to take the cod the schooners had got from the first part of the fishing, after that they could keep on fishing till late in August when they went home. The fishermen came in town to wash their clothes and to buy wool mittens and socks. They also bought salt for the fish to take with them, some meat and other things. Many of them came year after year and became good friends of the people in town. María hadn’t even heard about any French fishermen before she came from south of Iceland to Patreksfjordur in 1992. Halldór told people out there that there were many stories about the French fishermen by Iceland, both in old books and also some stories that hadn’t been written down yet. People out there started asking if we could collect them and maybe get them translated to French. María always liked collecting things and have been interested in the old Saga. After she started looking for old stories about the French fishermen she got more and more interested in them. She said « It is strange, for example when I’m at the small library here; it is like the right books are calling me! Once I took an old book from the shelf and looked in the first pages. I saw that this book was about some farmer in the North coast. I thought, “There is nothing about the French fishermen in this book” but somehow I was not allowed to put it back and opened it in another place, there was a really good story about this man going by a ship from the North coast to Reykjavík 1907. They came to Patreksfjordur and he describes very nicely, how many French fishermen were in the small town and lots of French schooners on the fjord ». For her the most interesting part is to collect the stories. She now has 64 stories already translated to French, by a French lady in Reykjavík, Catherine Eyjólfsson. She has been living in Iceland for a long time and does a really good job translating. There also are photos to go with each story, both Icelandic photos and also photos taken by a man who was on a hospital ship around 1908 to 1910. Mrs Elín Pálmadóttir, a writer and a journalist in Reykjavík has made a large book about the French fishermen : « Les Pêcheurs Francais en Islande. Trois siècles de campagnes : mythes et réalités ». In Faskrudsfjordur in the East coast there is a museum about the fishermen. In Grundarfjordur at the Snæfellsnes- peninsula, in west of Iceland there also are some French things. Across the fjord from the town, there is a museum with a few French things. The most interesting thing at that museum is an old medicine box from a French schooner. That box was used for a long time, by a homeopathic doctor, who lived in this area. 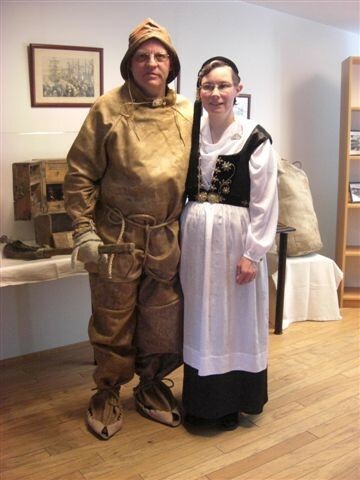 In the years 2001 and 2002 María and Halldór organised a French- Icelandic fisherman’s- day in Faskrudsfjordur. People from France came to celebrate with them and the second year there was an artist from France who made a monument in memory of the French fishermen. In summer 2009, she had an exhibition about this old communication in Reykjavík, at Alliance Francaise. They came in Fécamp on the 22 of october 2010.